One Super Mario World plastic case. I will choose yours at random. Includes: Item As shown! - This is for the Case Only! Playstation 2 Grand Theft Auto San Andreas CASE,MAP, GUIDE ONLY. Votre boîte PS4 est abîmée ? Commandez-en une officielle comme neuve ! Prix pour une seule boite ! Broken PS4 box ?? Buy a new one ! The price is for one item only ! Lot included: Tom Clancy's The Division - Steelbook. 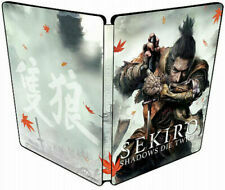 Limited Special Steelbook Only. Scratches on the steelbook (4, 5 pictures). If we have other versions that you want, we will list them for sale. We've added resealable wrappers too. Japanese cases are different. Item is located in the UK. Crazy, but that's how they work. This is for the 3DS Fire Emblem Fates. rom the limited edition. Conquest/Birthright ART BOOK Only. .50mm 20mil Acid-Free PET Plastic! Many other sizes! This is for the 3DS Fire Emblem Fates Conquest/Birthright Steelbook Case Only! Démo jouable. ABE Oddysée. Jeu PLAYSTATION 1. Le point mondail relay peut se trouver loin de chez vous (par exemple 20km) et vous devez allez le retirer par vos propres moyen. Pensez à verifier où se situe le point le plus proche de chez vous. Ich verkaufe hier die OVP Anleitung -> ohne GBA. Hello together. This is for a Evil Within 2 Steelbook Case Only! Case is G2 Blu-Ray Size. Ohne Innenkarton. Die OVP wurde an einer Seite geklebt. Achten Sie darauf, dass Ihre alten Batterien/Akkus, so wie es der Gesetzgeber vorschreibt. ist für Sie kostenlos. den gewöhnlichen Hausmüll ist verboten und verstößt gegen das Batteriegesetz.